It's officially March 1st, and we all know what that means - spring is coming! I can't even begin to express how happy this makes me. Seriously. You've heard me whine on numerous occasions about my disdain for winter, but in 19 days, it is officially over! Yay colorful flowers! Yay green trees! Yay spring dresses! The almost arrival of spring has also gotten me thinking about how my house could use a serious spring cleaning. I'm not the most organized person (I like to blame it on "creative person brain" to make myself feel better), and there is a whole lot of clutter and general winter gloominess going on here. Although I'll undoubtedly procrastinate the actual organization stuff for as long as possible, a spring makeover of some sort is definitely in order. This season, the colors tangerine and mint are huge, and I plan to add some new artwork and decor pieces in those color schemes to freshen things up. In my head, however, I'd like to do much more, as can be seen in the gorgeous tangerine and mint furniture, appliances, and decor above. If I win the lottery or stumble upon a buried treasure or something, I'll be redoing my entire house for spring with all of these pieces. Cross your fingers for me. If I find that buried treasure and get my dream spring home makeover, I'll be sure to post lots of pictures. Promise. Pssst... Before you go, make sure you take a couple of minutes to visit the amazing new and returning Bubby and Bean sponsors for March! I'm truly in love with their shops and blogs, and highly recommend checking them out. (Over there! In the right sidebar!) Lots of goodness going on. Those owl vases are perfection! Just did my nails in these colours, and though "man, this would make a bangin' colour scheme" - love it! This would totally be my dream makeover too!! That refrigerator is so cool!! The chair is also lovely. You are right! Quite dreamy! I was trying to pick my favorite piece but couldn't! Marvelous! Oooh, those are all just gorgeous. 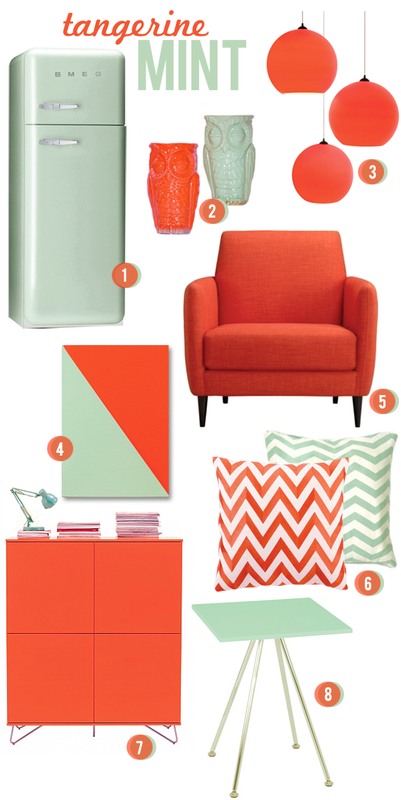 What a great color combo--Pantone's color of the year and mint, everyone's fave for spring! I am in love. Gotta get me some mint stuff pronto. such a fun and fresh colour combo! I like the orange chair! That mint smeg is to die for! I'm in love with mint green. And I cannot WAIT for spring either! Today it was 68 degrees here, yet it's supposed to snow next week. Ha! What a stunning color combination. I love this! What a gorgeous collage! I'm in love with this colorway and all of the items featured in it as well. Lovely. This post may have caused me to drool on my iPad...just a little. Great picks! We just redid our blog in seafoam and peach for spring! Can't wait for it to arrive! I'm on the hunt for the perfect pair of mint green skinny jeans... Must have! Side note: it also makes us very happy to see our little badge in the sidebar! You're our very first sponsorship and we're so pleased! I love the colors. I am hoping to have that beautiful chair along with the pillows and Flouro shade pendant. I guess these would definitely give our house that warm cosy atmosphere. Thank you for your ideas. I recently fell in love with this color combo and am hoping to incorporate it into our living room in the new house!! Love these ideas, thank you!